Wawerũ Mwangi is a high school teacher who lives and works in Naiyasha, Kenya. He’s a linguist by training and has written numerous high school textbooks, as well as vernacular texts for primary schools and a teacher’s guide in the Kikuyu language, which have been approved by the Kenya Institute of Curriculum Development (KICD). Ms. Ruth Munguti has begun the process of becoming one of SIL LEAD's first Certified Bloom Trainers. We would like to introduce her and let her tell you why she is passionate about Bloom training. Ruth working at the recent Mozambique Bloom training event, which she facilitated. Ruth: I was born and brought up in Machakos County in the Eastern part of Kenya. Having lost my father at the age of 9, I grew up with normal struggles like many other children. After my secondary education, I came to the city (Nairobi) and worked in the informal sector for three years. It was during that time that one of my employers identified my talents and paid for me to pursue a diploma in Information Technology and Management. This was a two-year program and it was what opened my doors to formal employment. My first formal job was with the National Museums of Kenya (NMK), where my primary duties were to create and manage Access databases. I was involved in training staff in computer applications and created websites for one of the departments. After two years with NMK, I got a job with SIL as an Administrative Assistant in the Project Management Office where I continued to use Access database for SIL Africa Area projects. I have worked in this department since 2002 in various capacities and am now the Project Funding Coordinator for SIL Africa Area. Besides my Project Funding role, I work as the Finance Officer for the SIL Advocacy and Alliance Building (AAB) department. I am also involved in mother-tongue materials development. While working with SIL, I completed my Bachelor of Commerce degree in Accounting/Business Administration and Management and an M.A degree in Project Planning and Management. I am married with three children, Imani (9.5 years), Baraka (7 years) and Fadhili (5 years). Malynda: Why did you want to become certified as a Bloom Trainer? Ruth: I have a keen interest in technology and capacity building and therefore like taking such opportunities. Having worked with Bloom before, I want to train others to use it, to enable them to produce more books for learners. I want to take part in giving the learners the tools that will enable them to become more competent. Malynda: What do you value most about Bloom? Ruth: Its simplicity and availability to those who would like to make use of it. The books available in Bloom that can be downloaded for children to read as well as to be translated into other languages. Malynda: What sort of difference do you see Bloom making? Malynda: How did the Bloom Trainer Certification process help you? Ruth: I learned more about Bloom as I went through the certification process. There were certain aspects that I didn’t know, I had the opportunity to ask and get the answers on how to do things I wasn’t familiar with. Malynda: How do you feel about the Bloom Trainer Certification process? Ruth: It is important to master our skills before we start training others. When we go out to train, it is necessary to have the answers to the questions that the learners will ask. The certification process really helps equip us for the task. Malynda: Who do you anticipate training to use Bloom? Ruth: A number of the staff in AAB are interested in learning Bloom. I would be glad to train any other groups that have an interest in learning Bloom and using it. Bloom has been gaining popularity and it is my hope that more training opportunities will come up. Malynda: Tell us about some exciting ideas you have about how Bloom can be used in your context. Ruth: A few years back AAB conducted research in a number of schools in the Eastern Region of Kenya. The purpose was to find out how some Mother Tongue (MT) books were being utilised in the schools. We also wanted to asses the impact on student reading competencies. We observed that in most of the schools that we visited, the MT books were primarily what was available for the children to practice reading. There were few other books available, except for curriculum books. Children who had continuous exposure to MT books were gaining fluency in reading. However, most children lacked reading competency. Part of the reason for this was that they did not have enough reading materials to practice reading. Bloom is a resource that can be used in such contexts to allow children and literacy workers to write books, print them, and make them available for reading. Books available in the online Bloom Book Library can also be printed and used by these children. Community authors and literacy workers can also use Bloom to come up with simple multilingual vocabulary books for use in their communities. Malynda: Thank you, Ruth. Is there anything else you’d like to add? Ruth: I am grateful for the privilege to be part of the Bloom training team. Having gone through the certification process, I look forward to participating in future trainings and to pass on the knowledge to others. If you are interested in participating in the Bloom Trainer Certification, contact us at bloom@sil-lead.org. In the paper Learning to Live Together, Margaret Sinclair and Jean Bernard tackle the question, “What can education systems do to build mind-sets supportive of peace, tolerance, respect for diversity and responsible citizenship.” As part of their approach, they advocate for the use of stories to teach ‘learning to live together’ themes: “There is substantial research to support the impact of carefully crafted, relevant stories on listeners in terms of bringing about associated behavioural change” (p.9). One of SIL International’s most effective teaching narratives is Kande’s Story: How a community can love and care for people affected by AIDS. The book tells the story of a little African girl, Kande, whose parents both die from AIDS, leaving her and her brother orphans. Critical information about HIV and AIDS are embedded in the story line. Stigma, marginalization, and exploitation are depicted, but also how to care for someone with AIDS and ways that a community can come around those who suffer. Here is our original blog post about Kande’s Story. Last month near Pucallpa, Peru, our partner organization AIDI (Asociación Indígena de Desarrollo Integral) sponsored a Grade 2 primer development workshop with the participation of teams from six minority language communities. Four of the languages are the most spoken indigenous languages in the Peruvian Amazon—Asháninka, Awajún, Shipibo, and Matsigenka. Map shows where the participants language groups are located in Peru. Dr. Patricia Davis led the this four-week long workshop. The workshop was designed to develop Reading Primers for Grade 2 and also provided a short training session on how the primer lessons should be taught. Dr. Davis and her Peruvian assistant, Eva Mamaní, supervised drafting and checked the materials as the authors progressed. In addition to the six language teams, another team finished a textbook for teaching Spanish in Grades 1 and 2. Two additional participants arrived unexpectedly to complete a Kindergarten Workbook in the Shipibo language. Iris and Mercy heard about the workshop and wanted to complete this desperately needed workbook. Access to books in this area is a challenge that AIDI has worked earnestly to overcome.AIDI and numerous other indigenous organizations are banding together to petition for the printing of the books and seek new sources of funding. (Until the indigenous organizations began to support the project this year, AIDI had not been successful in finding funding.) 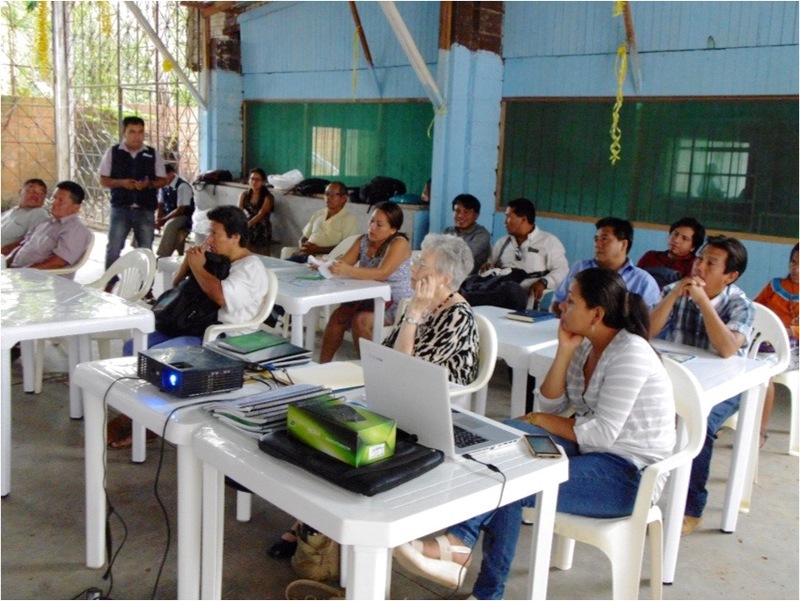 In the second week of the workshop, reports of the workshop were broadcast by radio to over 400 Shipibo communities. These broadcasts resulted in requests for books in that language. This was good news given the concerns that the Shipibo workshop participants have about the fate of their language. Excitement was tangible among the workshop participants, although the work was hard and the weather warm, despite the shade of a large mango tree covering the working space. Dr. Davis wrote that she is grateful for the friendship and loyalty of these capable people. They demonstrated the heart of International Mother Language Day, whose theme this year is “Towards Sustainable Futures through Multilingual Education”. On its web page dedicated to this day, UNESCO writes, “It is through the mastery of the first language or mother tongue that the basic skills of reading, writing and numeracy are acquired. Local languages, especially minority and indigenous, transmit cultures, values and traditional knowledge, thus playing an important role in promoting sustainable futures.” So this year as we celebrate International Mother Language Day, we reflect on the positive impact multilingual education has for millions of indigenous language speakers around the world. The workshop led by Dr. Davis is a wonderful example of this. We applaud the commitment and hard work of Dr. Davis and the educators from these six minority language groups. As the participants from this workshop return home, they are anxious to use the books in their schools and to continue promoting mother tongue education. Because of the month spent learning together, they feel they know how to teach better and look forward to passing on to others what they have learned. SIL LEAD partners with AIDI to provide scholarships to indigenous teachers in the Peruvian Amazon. Through their sponsorship of and participation in the workshop, their knowledge of and commitment to multilingual education was also strengthened. Thank you for helping SIL LEAD fund scholarships so that indigenous teachers in Peru can earn their teaching certificates so that they may continue teaching students in their mother-tongue languages! At recess, the children get a bowl of hot milk and quinoa crackers. I recently had the opportunity to visit with the leadership of the Asociación Indígena para el Desarollo Integral (AIDI) in Yarinacocha, Peru. SIL LEAD has partnered with AIDI to help provide scholarships to indigenous teachers who are seeking to complete their teaching certificates (títulos). While there I also visited one of the universities and a teaching institute where the scholarship recipients are studying. But the highlight of the visit was having the opportunity to see a couple of the scholarship recipients teaching students in their own language. Having spent a few years of my youth in Yarinacocha, I was amazed by how much things have changed. Roads that were once dirt are now paved. Land that was once used for grazing cattle is now covered with houses. Sadly, most of what I knew as jungle is now gone. And everywhere I looked, people were talking on cellular phones. But in other ways, things have remained much the same. One of the constants is that children in the Peruvian amazon are still struggling to get the education they deserve. But, thankfully, there are teachers who are striving to help these children learn. And some of these teachers recognize the importance of helping these children learn in their mother tongues as well as in Spanish. While in Yarinacocha I witnessed Shipibo and Yine children learning in their mother tongues and in Spanish. While visiting an elementary school, I notice how the children’s eyes brightened and their smiles widened when Jeiser Suarez, the president of AIDI, spoke to them in Shipibo, his mother tongue. Their teacher, Janes Percy Cruz Laulate, also a Shipibo, is a member of AIDI. The students celebrated our visit by singing a song in Shipibo. Yine preschools learning to treat headaches with celery leaf paste. While at a preschool for Yine children (many Yine have migrated to this area from southeastern Peru), I watched as these precious children were taught in Yine about the medicinal values of plants. After they treated each other (and themselves) to some soothing mashed up celery leaf paste on their foreheads, I became their next patient. Kelly Urquia Sebastian, a Yine who moved to Yarinacocha as a child, is one of their teachers. She is completing her título, and once done hopes to become an elementary school teacher for Yine children. I also had the opportunity to meet Iris Mori Cairuna. Iris is one of the newest scholarship recipients. She is already making headway on completing her título. Although Iris graduated from the Universidad Nacional Intercultural de la Amazonia (UNIA), she could not afford the additional costs associated with earning her título. Thanks to the generous donations that SIL LEAD has received in support of this scholarship program, Iris should complete her thesis and earn her título this year. Once she does, she will be able to apply for a full-time position as a bilingual elementary school teacher. Thanks for helping to make the dream of teaching children in their own language a reality! **A brief video with pictures related to this post can be viewed here or below. Please be sure to turn the subtitles on in either English or Spanish if you’d like a bit of an explanation of what you are seeing. In the second issue of Literacy Matters magazine, Dr. Agatha J. van Ginkel’s has published the article “Multilingual Readers, Transition Issues in Multilingual Settings”, which discusses the key role that multilingualism plays in students’ literacy and education in Uganda. Her article presents two important concepts about the relationship between the home language and English. Dr. van Ginkel presents the interdependence hypothesis as the argument that “in bilingual development, language and literacy skills can be transferred from one language to another.” (van Ginkel, par 3) Uganda has updated its education policy to leave space for both languages in its curriculum. But alongside interdependence, there is the threshold theory, where it has been found that a child must have a foundation in their home language, or mother tongue, that enables the transfer to occur smoothly to a second language. And van Ginkel questions whether the current policies in Uganda are enough to facilitate such transitions. The author also challenges the widely held belief that with language learning earlier is better. The second concept the article presents is the importance of understanding the difference between conversational language and academic language. van Ginkel explains the different ways that these languages are retained by students and that the research in Uganda would suggest children need five or six more years of their home language at the current rate of learning. Citing Marianne Nikolov’s paper, “An Early Start: Young Learners and Modern Languages in Europe and Beyond” from 2000, van Ginkel explains that without the proper classroom environment that prepares students for introduction to the second language, early introductions can actually do more harm than good. Given the good progress that has happened with the language policy in Ugandan schools, further research into the impact of bilingualism in early education and strategic improvements to curriculum will bring additional progress towards more beneficial literacy in both home languages and English as a second language.